We take the time to make your boating experience the best it can be from showing you how to operate your boat on the water by our experienced staff to giving free classes on local boating navigation and destinations. We offer a free month’s moorage to new long term tenants. We even offer our tenants 50 cents off per gallon on fuel (cash price) and special savings on boat supply purchases. Our clubhouse/ yacht club hosts year round boating events such as like classes, potlucks and cruises. Boat slips – We have 180 boat slips accommodating vessels 30’ to 110 ’ in covered and open moorage. 30amp power and water at the docks. Most slips are single berth with deep water to handle the draw of deep keeled boats. Mobile pump outs are located on each dock, as well as a pump out station at our fuel dock. 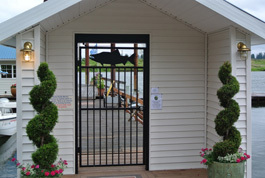 Office/Store/Fuel Dock– The floating marina office and store is open 7 days a week. Closed Sundays during the winter. Gas and diesel are available at a discount to our tenants. Beer, ice, pop, chips, snacks are available in our store. 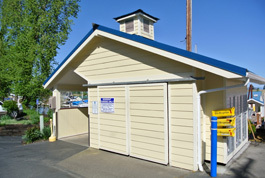 A pump out station is located at the fuel dock for your convenience. Visa, Mastercard and Discover Card are happily accepted. In addition to the weekday office staff, Rocky Pointe Marina has an on site caretaker. Security- Safety and security is very important to us. Rocky Pointe Marina is a gated community and has 16 security cameras recording activity throughout the facility. Our marina does monthly and annual inspections of electrical shore power connections and tests all new arriving tenants boats for proper ground fault and bonding to identify stray current that may potentially cause corrosion or electrocution. Boatyard– The Boatyard at Rocky Pointe is conveniently located within our facility. A full service boatyard, that can work on your boat in the marina or tow your boat to the Travelift to service your boat. There is a qualified crew on site to help with emergencies as well as routine maintenance. Boat ramp– Our boat ramp on site suitable for boats up to 16’. Private Ramp – Our Tenants Only. No public parking is available. Restrooms/Laundry- Each section of marina has its own restrooms with showers and a coin-op laundry facility.